Laura has trained at The Northern School of Contemporary Dance, The Cunningham Studios, Paul Taylor Dance Company, Perri Dance Center and Alvin Aliley Studios in New York. She has performed with a wide range of companies and projects, most notably with Travelling Light Theatre Company and Oily Cart Theatre Company. She is Artistic Director of about NOWish who make immersive movement and sound experiences for young children and their accompanying adults. She is a passionate educator and leads workshops and classes in a number of different settings and recently gained her Early Years Teacher Status. Laura recently became an Associate Artist of Theatre Bristol and became involved in the Skills Exchange through her relationship with Theatre Bristol as an integral contributor and regional representative for the south west in the development of the Artists' Exchange Programme. On day 4 of the skills exchange, Laura was moved to share her experiences and strategies for managing self care, resilience building, and knowing when you are enough. In an industry in which we set up environments and strategies to support others, Laura talked about how we can find mechanisms to support ourselves and be honest about how we are coping. In her own words she shares her reflections following on from the Skills Exchange week, and some of the practices that support her in her personal and professional work, following struggles with self worth, confidence and emotional value. There's a sensation that has always been hanging over my shoulder throughout my life, the feeling of someone’s strong, forceful hand about to steer me out of the room I so desperately wanted to be in saying, "you’re not supposed to be here, you’re not enough". I’m sure it’s a feeling many other artists feel, so I’m here to confess in the hope it will connect with someone who also feels they’re too about to be asked to leave. The AEP Skills Exchange week generated so much light, inspiration, creativity and hope, but all the while I feel the darkness heavy with me. It’s like I had been sent to represent the dark side of living creatively for others, as dance artists so often do. I am a highly sensitive being and carry a lot of darkness in my soul at all times, it stays with me at my side, sometimes quiet, sometimes screaming and sometimes smothering. Towards the end of the week I put forward my confession to the group. I told them of dark periods, of the abusive relationships, the breakdowns and the messiness. Not to wallow in it, but to share, in case there was someone in the room who carried the same darkness with them, or someone knew someone else who did. I have always been open about the mess that is my brain, from making a point of turning up at events with mascara down my face from the tears of despair, to being honest with the dancers who performed my work with beauty and dedication, that I will always be eternally grateful for. For my brain and work is absolute, there’s no halfway space, it’s in or out and for many years there was no safety net. So I confessed to the AEP group in the hope it might help/inspire/connect, and to talk about the construction of the safety net that was so desperately needed. Each one of us is brilliantly different, but the world of social media can mean that the lines between ourselves and others can get blurred and you can get lost in others’ identities and needs. I needed to know myself to know what sent me spinning out into deep space, and thus what my axis needed to be constructed of to keep me locked into a healthy orbit. It’s often a rocky road to find what you need to be your axis, with bits of you often flying off at precarious angles and sometimes clouting loved ones in the face as you go. It’s not fun, and it's not healthy to glamorise the suffering artist, as many still do in a, in my opinion, highly irresponsible way; but to acknowledge the dark side of the person who can bring so much light and love to the world. As a wise friend once told me, all the emotions are valid, and I believe as artists we can represent the spectrum for people. A key skill that we discovered we all do during the AEP Skills Exchange week is to create a caring and safe creative environment for people to engage with dance and their own creativity. But how do we do that? What do we put in place to create this ‘home’ for them and ourselves? Do we think to create it for ourselves? I shared the practice I had learnt on my massage and bodywork course, a practice that has helped me construct my own axis, when I had existed as only a small pool on the floor. The session that Tim Casson led on day 3 of the AEP Skills Exchange focussed on how he engages people with the joy of dance by asking the ‘right questions’. In a joint discussion with Tom Hobden, we considered the different ways we ask questions of our dancers - to develop empathy, to make connections, to find shared interests and to demystify the world of creativity, to enable people in the community to access dance. In his own words, Tim reflects in his blog post below on some of the questions he asks himself and the groups he works with, and offers a few thoughts on his practice as a community artist. We began by playing two of my favourite games, both stolen and adapted from theatre; Soundball and the Monster Game. If this is a game, is it still dance? What is the minimum number of words I can use to teach these games? Can the games be taught only via the body? How observant can we be of others? How much do we commit to the ideas that are proposed? Will we accept what is proposed by others? How can we play this game ‘better’? How silly can we be? Do we feel safe enough to be silly? How can we feel safe enough to be silly? Should we laugh in a warm up? Should we laugh this much in a warm up? We then went on to do a rather expedited version of ‘The Dance WE Made’, my flagship project that invites (often untrained) participants to choreograph on professional dancers, with no experience required. 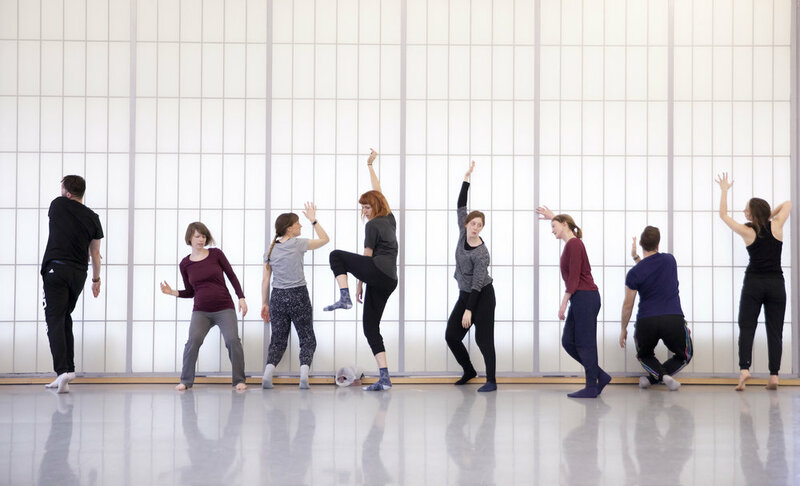 This began with some training around methods of ‘translation’, as TDWM uses a fundamental principle of ‘conversation into choreography’ to create new movement as quickly and simply as possible - a process we call ‘collection’. The movements created are then compiled by the performer, and subsequently directed by the participant, crucially putting them in control of the material - we call this the ‘edit’. The new dance is then performed, usually in the space in which it has been created, and it’s also often recorded and placed online for anyone to see. What questions can I ask that are Choreographically useful? What questions provide responses that offer a variety of interpretations? What questions would avoid negative associations, and aren’t too emotionally loaded? What questions can I ask that ensure the participant doesn’t have to think too much? How can I get the participant to trust me very quickly? How can I acknowledge the weirdness, so that we can just get on with making dances? What does it mean if someone turns me down - do they hate dance/me/themselves? How can I work in a way that expands the participant’s view of what dance can be? How can I make this process simple? How can I make this process speedy? How can I process that much information? How can I make a dance about that? How can we talk about dance without using jargon? Will this experience change how they see themselves/dance/me? And how would I ever know? A lot of my work as a community artist, uses participants (often members of a local community) as the primary source of inspiration; bringing to life their thoughts, ideas, experiences and stories. On reflection, I think I began working in this way because of a combination of my own fear that I had nothing to say, and being inspired by having worked in various community settings and witnessing the untapped creativity that all humans seem to possess - no matter how many times people protested and told me that they’re “not creative”. My perception of a lot of community engaged practice that uses the participants’ stories and experiences as source material, is that it is often ‘issue based’ and defaults to a certain heaviness. It’s not difficult to see why; we live in a world of darkness, struggle, and challenge, so these are possibly easier for us to access - particularly when working with participant groups who have been brought together because of their specific challenges. I suppose, my response to this perceived heaviness was to make sure that my personal practice would be focussed on finding the joy, and ‘The Dance WE Made’ is an example of this. At first glance TDWM may seem superficial; we pose everyday questions through 5 minute small-talk filled interactions about breakfast, journeys, birthdays etc. These topics are chosen for very specific reasons: they are not difficult to form an opinion about, responses can be found within recent memory, and we (mostly) avoid unlocking any sort of emotional angst (In 6 years I’ve not had anyone tell me about a traumatic breakfast they had…). Fundamentally, they provide us with a simple and universal ‘way in’ for the participant; all they need to do is have a chat and the dance will happen. The second question I asked was one of balance, “Does it always have to be all about the participant? As artists, could we use this to challenge and develop our craft and creativity? Yes, TDWM is about engaging participants with dance, and ensuring their experience is positive - it’s as much about advocacy as engagement. But it’s also about developing and acknowledging our artistry and choreographic skill. 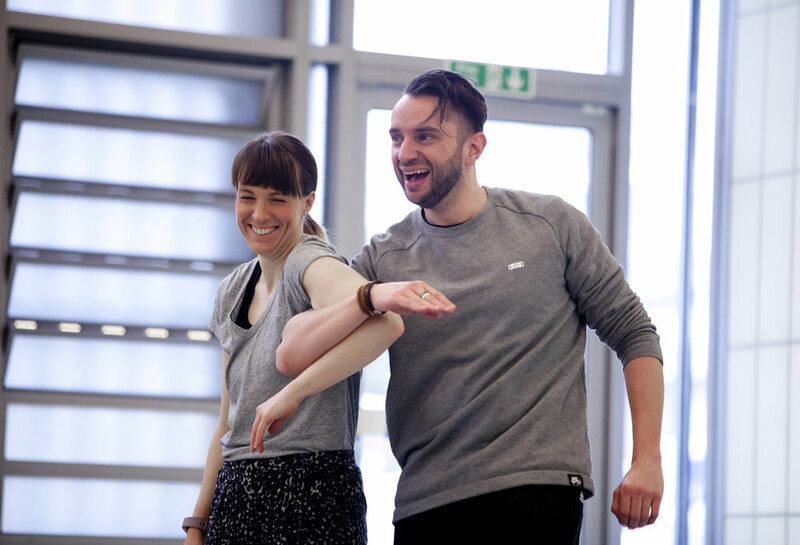 Whether in a workshop setting, or in public with people on the street, we never know how someone will respond to the questions we ask; so the challenge for artists within TDWM is how we take these ordinary conversations, and make them extraordinary by ‘translating’ them into movement. In my opinion, dancers are amazingly skilled super-beings! So this process isn’t just about making a dance. TDWM presents the virtuosity of creativity as the performance itself, by channelling the creativity that is within us all - and having the performers push that further, in collaboration with the participant and in real time. Then it becomes about joy - we see the participants enjoyment in co-creating, seeing their ideas brought to life, and the pride of watching their ideas performed by a highly skilled professional dancer, who has in-turn been creatively challenged. It’s as much about artist as it is about participant - and I hope this squashes a preconception about community engaged practice. Community work, doesn’t only have to be about the community and their experience, there’s a great deal in it for the artists too. Working with communities is artistic, creative, surprising, human and challenging. And one of the challenges that I love, is working out the right questions to get engage people with dance in creative, joyful and meaningful ways. On Skills Exchange Day 3, Hannah and Danielle collaborated to deliver a workshop exploring their joint interest of collectivity and ensemble from very different perspectives. How aware are we of the space? Of each other? Of our options? When we facilitate ‘ensemble working’, how are decisions made? Who’s voice is heard? What are our frustrations with the process? What limits us? These concepts encouraged us to question how we give autonomy to participants working as a collective when there is one overall leader; which leads us to the theme of my recent research Collectivity and Intimacy. In my workshop I shared the working processed behind my research with people with Parkinson's. The Collectivity and Intimacy project was developed out of a curiosity for the teaching method of collectivity which is used in dance for Parkinson's to make best use of mirror neurons and external cueing, which is a highly researched and a proven tool for supporting people with Parkinson's to move with more fluidity and intention. My research interrogates this teaching practice and questions whether it can be considered inclusive, as it is led by external direction (either visual, auditory, verbal or tactile) by the artist. In the process of researching I have worked with dancers with Parkinson's to experiment with handing over the autonomy to the dancers and how we go about this. I am interested in how we could embed tools for internal cueing within our artistic teaching practice. Some of the tools I experimented with included somatic, mind-body imagery; guided visual imagery; breath; interpretation of words. All of these stimuli were used to encourage freedom of interpretation in the body. What is the value of dance designed FOR..? Is this a different form of inclusive dance, made accessible to a particular demographic due to highly streamlined and meticulously constructed methodology, rather than due to its open access and inclusive approach to all people? How do we find a balance between directive approaches to delivery versus democratic leadership in artistic and teaching practice? Where do we place the most value?